Mini Clear Plastic Funnel for Filling Small Bottles or containers, atomizers, perfume liquids, essential oils. 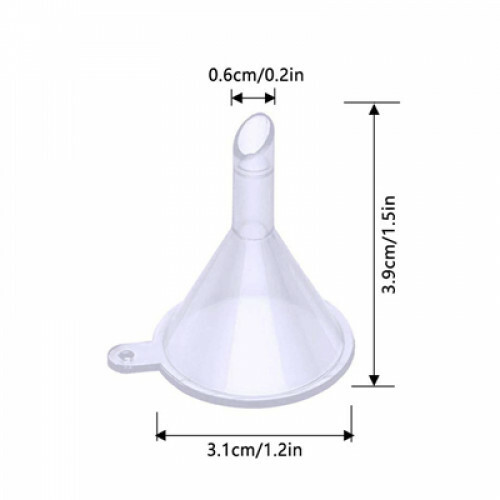 This mini funnel for filling essential oils, perfume oils bottles 2ml, 5ml, 10ml, 15ml 30ml, 50 ml and 100ml amber, clear or blue glass bottles is for filling cosmetic or other liquids, easy to clean.The neck of smallest funnel fits most essential oils and perfume bottles. The small funnel could prevent your perfume, essential oil, lotion and other fluids from spilling. The small funnel could prevent your perfume, essential oil, lotion and other fluids from spilling.